While the patient is under the effect of the nitrous oxide, the patient will stay awake and he or she will still be responsive. The patient will also be capable of having rational thoughts. A lot of people feel tense whenever they have to go to the dentist’s office. This may be because they are worried about having to experience pain or discomfort while the dentist works on their teeth. This is why in some cases, the dentist will suggest that you take nitrous oxide so you can stay relaxed and calm during the operation. There are also situations when the dentist will have to use local anesthetics as well as nitrous oxide in order to perform very complicated procedures on your teeth. It is also very useful when it comes to helping the patients feel serene while the dentist will be doing very long procedures. Nitrous oxide is also known as laughing gas. This gas is given to you through a mask that is placed on your nose. It is made up of a mixture of nitrous oxide and oxygen and it acts as a sedative that can help you manage both anxiety and pain. The combination of gases is generally safe to use, but the dentist needs to use the correct amounts of it. So the dentist can administer it safely to patients, he or she must be mindful of the safety margins of laughing gas sedation. In order to make sure that the patient stays safe, a proper delivery system, as well as visual and audio features must be installed so that the dentist can keep track of the patient’s condition and so that any adverse episodes will be detected right away. Dental offices that are using nitrous oxide must observe the proper work practices as described by the Council on Scientific Affairs. During the procedure, a patient that is under the sedation of nitrous oxide will stay awake and they can also maintain rational thought. They can also respond to touch and to speech. 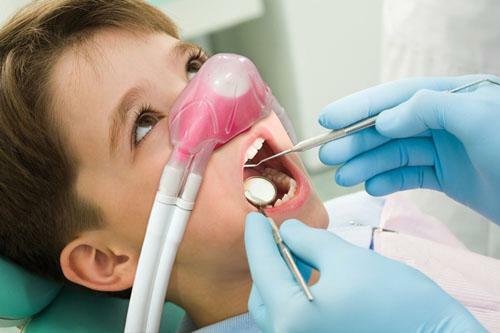 Nitrous oxide can be used on patients of all ages. So you will know whether or not going through nitrous oxide sedation is right for you, ask your dentist about it first so you will be able to get the best possible options and dental treatments.